New features: Use Talentag to ask feedback and build your ‘crowd-sourced CV’ » emp.ly blog - share jobs. add rewards. find great people. share jobs. add rewards. find great people. We’ve added a couple of nifty features to Talentag. In addition to badges you can now give and receive tags and vouches as well. For example, I could vouch my colleague Jüri in his role as the co-founder of Emp.ly. Or I could tag it with words that relate very specifically to that role and not anything he has done before. This way you can use Talentag not only to ask feedback generally or regarding a particular role you’ve had but all this feedback builds up your crowd-sourced CV. We’ve also made it easier to import your work history from LinkedIn. This is a good thing to do before you start asking feedback to your various roles. Last but not least we’ve added a Friends tab that lets you see your Facebook friends in a way you probably haven’t seen before – through a professional lens. 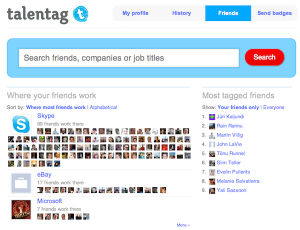 You can browse them by employers, job titles and of course by how much feedback they’ve received on Talentag. Co-founder and marketer at Emp.ly and Talentag, ex-Skype. I like kiteboarding, taking my kiteboarding gear to different continents and not losing my luggage. Good candidates are always hard to find because they are not actively browsing job boards. Social networks are much better for reaching the best people. Emply lets you post job ads easily and add incentives for people in your networks to spread the word, a sweepstake of Amazon gift cards among everyone that retweeted or shared your job posting, for example. Emply is used by small and medium businesses who want to hire the best but can't always afford to hire a full-service recruiter. These companies usually have reasonable social media presence, Emply just adds the automated incentives engine and sharing stats. The result is your job posting seen by more passive candidates you can dream of. emp.ly blog - Share jobs. Add rewards. Find great people.